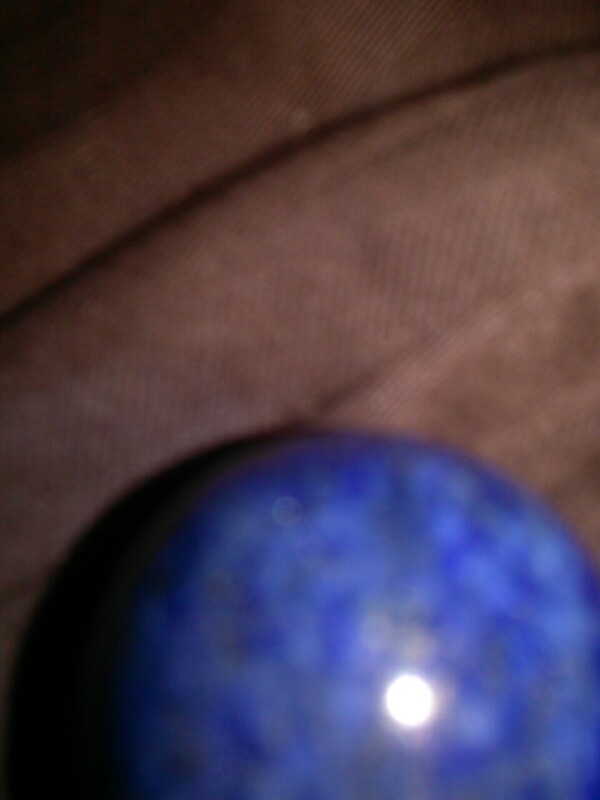 Part of blue lapis lazuli ball on a brown background, slightly out of focus. I sink into my body, and it feels like sinking into the moist brown soil in a redwood forest, full of fungus and forgotten redwood needles, and plants, and decay, and life, all at once. I may have left the forest in body, but in my soul it’s right there. Waiting for me to deepen and put down roots. I can feel every joint in my body as I curl up in a ball and lie on my side. They ache, but also say hello to me, tell me I’m alive, their voices indistinguishable from the aching. I stretch my senses out and out and out. I don’t know how I do it. I don’t even know exactly what I’m doing. I just know that even though my bed is my permanent home these days, seldom left except for doctor visits, I’m able to connect to the world more thoroughly than I ever thought possible. I can become the floor of a redwood forest or the sun hitting a granite mountainside. And I can see what most people can’t. Aspects of the world I know some others can see, but seldom talk about? Because how do you describe it? How do you explain it to anyone who isn’t already aware of it? I don’t know. These things are as ordinary as rocks, they don’t need to be put on a pedestal. But they’re so central to my life I have to talk about them. I have a doppelganger of sorts. Sometimes it feels like the two of us are branches of the same thing, connected at a fork. But if I follow the branch back to where we intersect, I can be part of her as well. I can feel the world from behind her eyes. I love to do it when she’s concentrating on something she loves. She becomes so focused and so delighted, nothing else in the world exists. Other times, though, after a long day at work, she feels buzzy and confused, like her brain just wants to take a nap. I am so glad she works with feral cats. She does so many things I’m not able to do. But I experience them through her, and doing that relieves me of any regret that I’m unable to do those things, as me. It feels like I can do them as her, and that’s enough. This sounds bizarre, but I’m told by people who know, that there are levels on which identity doesn’t work how people think it does. Maybe it’s really possible for two people to be part of one whole. It would certainly explain other experiences I’ve had. Where I connect to the world in just the right way at the right time, and suddenly I’m having the experiences and emotions of a mother who lost her child over a century ago. Or even stranger, I slide into the collected feelings of everyone who has ever had a certain experience. It hits me hardest when someone murders an autistic child, and suddenly I want to tell the world that we were there, we saw, we knew, we understood what nobody thought we could… except who is we? I slide in and out of those experiences without trying, and the anguish becomes mine for that moment before I’m just myself again. I’ve talked to other autistic people who experience the same thing after one of us is killed. It’s involuntary and heart-wrenching. But when I connect to her, it’s not by accident. I know how to find her. It’s like placing my fingers ever so lightly on a filament too thin to see. And then pulling backwards ever so slightly. And letting myself be guided slowly forward. To the point where we connect. I do it when I want to check in on her. I do it when I am too weak and too tired to communicate with anyone else, in any other way. I can touch her and know that she is real, that she is out there, that she knows I am here and recognizes how I feel at that moment. I do it almost instinctively when I am in unbearable pain. I touch her mind and she touches mine back, like holding hands with me only without the overload and exhaustion of having someone in the room. And in emergencies. True emergencies where I don’t even know if I’ll pull through. I reach out without even trying, from the stretcher in the ambulance, and she contacts my friends to make sure her instinct that I was hospitalized is correct. She’s never been wrong. Being around her is like the best parts of being alone and being near someone at once. We can communicate with each other about things that we don’t have the language skills to tell anyone else. We can tell each other things that are impossible to talk about without shared experiences. We know each other as deeply as it is possible to know anyone. And yet we have clear boundaries, we don’t bleed into each other in an unhealthy fashion, we are connected at the core yet separated on the surface, as it should be. And I lie here curled in a ball, leaning my side on the upward tilt of my hospital bed. I don’t have the energy or cognitive ability to write, to put things into words. But I can hope that at the right time, the words will come and I will be able to describe the inner life that is so hard to explain or describe to anyone but her. I soak in the night, as I soak in the earth. I reach out into a blue place. A deep shade of blue that glows like the sky above the beginning of a sunrise or the end of a sunset. I’m told that shade of blue has a meaning, but all I know is I catch it hanging around a lot, and that it’s a powerfully good part of the world. Sometimes I have dreams where the entire sky is that shade of blue, and they always seem amazing and important. 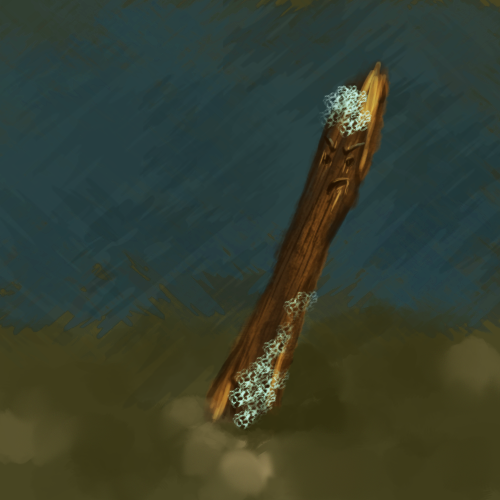 I try to incorporate it into my paintings. A lot of what I do at times like this is listen to the world. Listen to it with my bones, even the pain that runs through them seems to enhance my ability to listen. I don’t listen with my ears, I listen in ways that don’t have words. They feel like the forces of gravity, pulling in directions, as if my bones have been replaced by magnets. I listen in gravity and color and in the ability to lose myself inside of things, places, and people. This is my first language. All of my early memories are of textures, gravity, movement, and colors, blending together. When I was very sick and hospitalized, I had a dream that told me to go back to that, to listen in that way, to root myself in those early experiences of the world and keep going as far as it could take me. So, when I remember, I do. I sink into my body and I listen to the world, I feel its movements inside me, I see color and texture. And most of all, my entire body feels connected to the rest of the world in such a deep way that there aren’t words for it. I can feel where my place is, where I belong, and that I am there all the time. I prefer not to give these ways of experiencing the world a lot of words. I don’t even bother explaining how it works, other than that the world is different than many people think it is, and that my best mode of thinking and understanding is perceptual rather than conceptual. But I know these things are real, because other people who experience the world as I do feel the same textures and see the same colors. When I connect to someone, they know it and we talk about it. So whatever else this may be, it’s more than imagination. And for me, is one of the most important things in my life. This is where I get my strength. This is where I get my sense of connection, of having a place in the world. This is where I go when I’m too exhausted and in too much pain to do anything else. This is how I have come to know that my body is me, not a thing separate from me that I fight with. And this is how I know that I am much more than my body at the same time. That identity, time, and a lot of other things, don’t work the way people think they do. This is how I know that however else I feel about them, my disabilities are deeply embedded in my individual body, in the physical manifestation of my existence. They are not tacked on as an afterthought. And they are sometimes deeply involved in how I do this. My ability to see the world from this perspective at all is deeply connected to the traits that get me labeled autistic. Sinking into my body like that means constant awareness of pain, of things struggling to function but not always managing. Being bedridden for years has somehow enhanced these abilities, and so has encountering death up close and personal. Speaking of death, I could swear that as a young adult living in the redwoods again, my surroundings talked to me about it, in their own way. About how when you die, all these different life forms live off of you. Bacteria, fungi, plants, animals, trees. They all eat you, and you become a part of them. And in being part of them, you have been absorbed into the rest of the world. And there’s something profoundly beautiful about the way that death is part of life, and life is part of death. And that is why death holds no fear for me. But for now, I am alive. And I sink into my body. And joy is as deep and physical as pain. And they are as intertwined with each other as life and death. I feel my way towards my friend. I feel her focused delight in existing. Then I feel the sun on the granite, as if I am not me, but some combination of sun and granite, right where they intersect. I feel the sturdiness of rock that is part of mountains. I feel things that have never been given names, gravitational magnetic forces tugging deep in my bones. I never feel as if I leave my bedroom. I am firmly anchored right where I am, no matter what I feel, I feel it here. But I feel like I can touch other places, other people, without leaving this place. So I am curled up, leaning against the tilted bed. But I’m also curled up leaning against the base of the enormous redwood known to people from Redwood Terrace as the Mother Tree. I hear singing, without hearing a sound. And besides its normal colors, the tree is also a shade of lavender that exactly matches my amethyst ring. And also transparent to a light so clear it’s invisible. A solidness sinks down into my bones. I stay there until I fall asleep. — I’ll stick to the trees, thank you. Hufflepuff. Came from the redwoods, which tell me who I am and where I belong in the world. I relate to objects as if they are alive, but as things with identities and properties all of their own, not as something human-like. Culturally I'm from a California Okie background. Crochet or otherwise create constantly, write poetry and paint when I can. Proud member of the developmental disability self-advocacy movement. I care a lot more about being a human being than I care about what categories I fit into.